Contemplative Leadership is a one-year certificate program in spiritual deepening and contemplative leadership. It is ideal for pastors and others seeking to deepen contemplation in ministry and life. Most participants will have previously found contemplative practices transformative in their personal life and desire to grow in creating and equipping contemplative groups in their communities. TUITION: $1950*, plus an Application Fee of $200 (non-refundable, not part of tuition). The balance of tuition may be paid in full at any time. 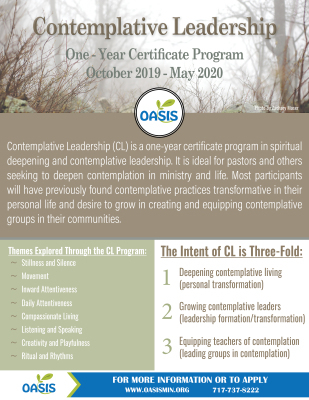 *Participants who have previously completed the Oasis Ministries Contemplative Leadership program will receive a discounted tuition rate of $1560 (normally $1950). If the application is received by May 31, 2019, the participant will receive a discount of $50 from their tuition. If the application is received after August 31, 2019, $50 will be added to their tuition fee. Payments by check or credit card (MasterCard, Visa and Discover) are welcome. If paying via installments we anticipate the first payment to be $200 (minus $50 if application was received prior to May 31, 2019, plus $50 if application was received after August 31, 2019). The first payment is due upon acceptance into the program (by September) and payments of $250 monthly October- April. Andrew Barton recently retired as Senior Pastor of First Presbyterian Church of Hamilton Square, NJ. He now serves as pastoral mentor and spiritual guide to seminary students and clergy, and offers spiritual direction and hosts retreats at his home "Green Pastures". Andrew completed the Oasis programs Spiritual Direction for Spiritual Guides and Contemplative Living. 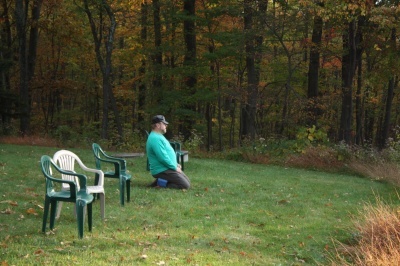 He has also completed the Shalem Institute for Spiritual Formation certificate program, Leading Contemplative Prayer Groups and Retreats led by Tilden Edwards, Gerald May and Rose Mary Dougherty. Glenn Mitchell is Director of Oasis Ministries and has been a teacher with Oasis since 1996. Glenn was trained in spiritual guidance by the Shalem Institute and Oasis Ministries. He is a lead teacher in Spiritual Direction for Spiritual Guides and offers leadership in other Oasis training programs and single day events. Glenn has a practice of spiritual direction based in State College, PA. Glenn has two adult children and is married to Theresa Shay. 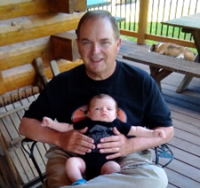 Glenn loves all things contemplative and in his spare time enjoys watching birds, restoring their 1800's log home and making things from wood. Dale Selover serves as Pastor of Spiritual Formation and Director of the House Next Door, Prince of Peace Lutheran Church, Princeton Junction, NJ. She is a spiritual director and retreat leader in the Evangelical Lutheran Church in America. Dale is a graduate of Gettysburg College and the Lutheran Theological Seminary at Gettysburg. Through Oasis Ministries, Dale has completed the Spiritual Direction for Spiritual Guides and Contemplative Living programs.